It is said again and again in rock climbing, "use your feet." Unsuprisingly, it is also said over and over again in ice climbing. Good foot technique is the core to overall good climbing technique. Ice climbers don't have as many options as rock climbers. When an ice climber is on a frozen waterfall, there are only a few things that she can do to use her feet. She can frontpoint (the German technique), she can use the American technique or she can use the French technique. Following is a simple breakdown of these techniques as they pertain to ice climbing. In mountaineering, we try to avoid frontpointing as much as possible. This is because it wears out the calves quickly. 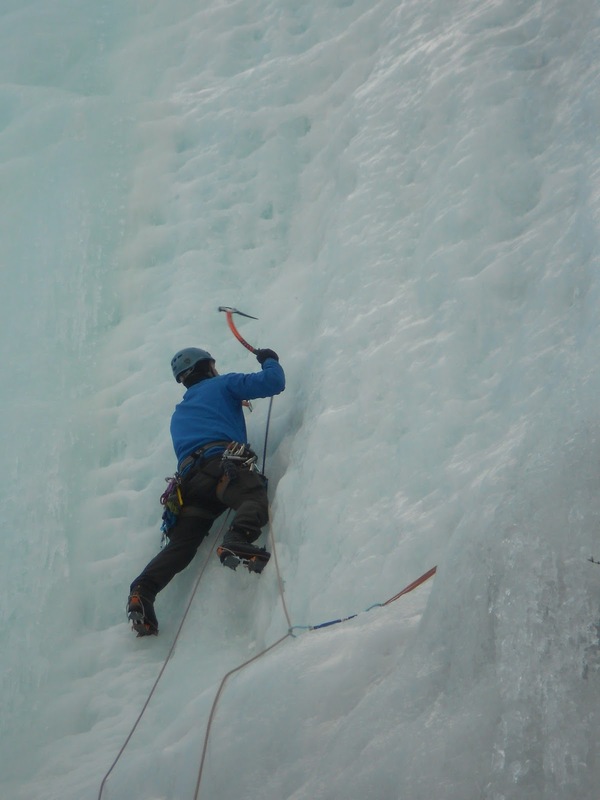 In waterfall ice climbing, it is incredibly difficult to avoid this technique. Indeed, most of the climbing that one will do on steep and vertical ice will require frontpointing. In this photo, the author's feet are splayed out and he is frontpointing on steep ice. Proper frontpointing requires that not only the front two spikes are engaged, but that the second set of teeth are also engaged. To do this, a climber must drop her heels. This allows the secondary spikes to bite into the ice. In this frontpointing photo, it is possible to see that the climber has dropped his heels. 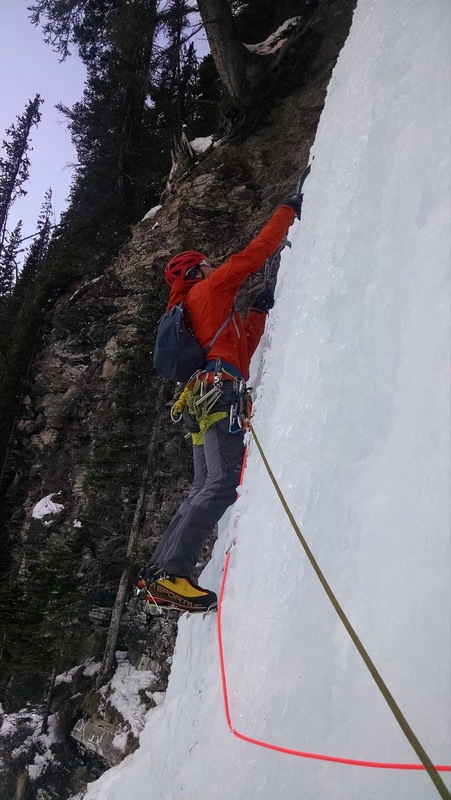 The American Technique is a great way to rest your calves while ice climbing. It is quite common for people to get fixated on frontpointing and not to take rests. The American technique allows for rests. This technique, also referred to as Pied Troisieme, requires one foot to be placed with the frontpoints engaged while the other food is flat in a French position. French technique is essentially a technique wherein the spikes on the bottom of the crampons are fully engaged on the ice. Fully engaged crampons do not work the legs anywhere near as hard as techniques that require frontpoints to be engaged. As stated above, French technique is a way to avoid overuse of your calves. Some time ago, we did an entire article on French Technique and the use of the Cross-Over Step. To read that article, click here. Whenever you ice climb, think about your feet. But don't just think about them as cold lumps that might help you through the climb, but instead as a dynamic part of your body. If you always think of them as dynamic, it is far more likely that you will be able to use them in an effective way. Red Rock Rendezvous - March 16-19, 2018!